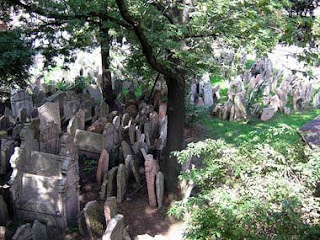 I would like to share with you a place I found quite moving - the Old Jewish Cemetery in Prague. 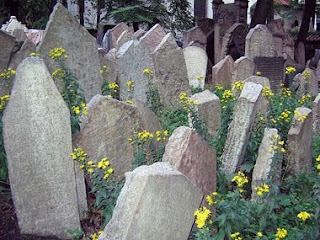 It was founded in 1478 and for more than 300 years it was the only burial ground where Jews were permitted. It is quite compact in space so burials were on top of one another, sometimes up to 12 deep. The site contains an estimated 100,000 bodies and over 12,000 gravestones. The stones are amazingly jumbled and quite fascinating. I like the following picture because to me it shows the cycle of death and life. And here you get an impression of how close the gravestones are. The only way into the cemetery is through Pinkas Synagogue which was founded in 1479. Today the Synagogue is a memorial to all the Jewish Czechoslovak citizens who were imprisoned in Terezin concentration camp and later deported to various Nazi concentration camps. 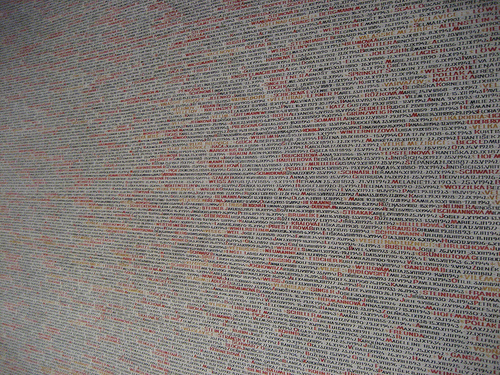 On the walls of the Synagogue are the names of 77,297 people who didn't return! The building also houses an exhibition of children's pictures from the Terezin concentration camp. This photo was originally uploaded by: ccarlstead. I love visiting old cemeteries in Europe and this one seems particularly interesting Cherie. To see all those names must have been quite moving. I found it so when I went to the memorial for the Vietnam war in Washington DC. Just lists of names carved in marble but it brings it all home to you. You could see people there looking for names of people they knew or were related to. Yes, have to agree - fascinating indeed. jmb - It was very moving. It also showed how old each person was and it was quite upsetting to see so many children's names.